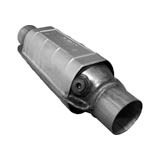 AP catalytic converters are designed to be durable and our use of stainless steel materials provides for a long life product. Premium-grade ceramic substrates are processed in our factories to OEM performance and reliability standards. Our research engineers are specialized in material science, surface chemistry, and metallurgy. 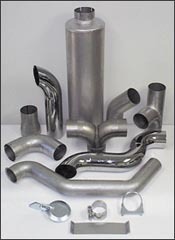 State-of-the-art production methods, coating techniques, advanced materials, and chemistry, all come together resulting in industry leading designs and emission control solutions. 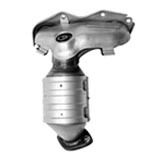 OBD I and OBD II technology in all our Universal Catalytic Converters. Many sizes and shapes to fill all your installation needs. Our OBD II LEV cats are perfect for Federal and California emission vehicles...Keeps the MIL light off! on pipes and converters without replacing the entire assembly. Excellent profit and great customer satisfaction. Today’s fleets of medium and heavy duty trucks along with school buses are older and require more maintenance at a higher frequency due to age and mileage. Whether local delivery or long haul trucks, AP’s Heavy Duty group has a broad range of exhaust and emission products to assist you in meeting their maintenance needs. 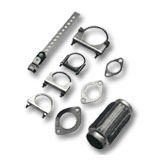 hold system connections tightly for a safe and secure fit.